Summary: Quinlan McKee is a closer. Since the age of seven, Quinn has held the responsibility of providing closure to grieving families with a special skill—she can “become” anyone. Recommended by grief counselors, Quinn is hired by families to take on the short-term role of a deceased loved one between the ages of fifteen and twenty. She’s not an exact copy, of course, but she wears their clothes and changes her hair, studies them through pictures and videos, and soon, Quinn can act like them, smell like them, and be them for all intents and purposes. But to do her job successfully, she can’t get attached. Now seventeen, Quinn is deft at recreating herself, sometimes confusing her own past with those of the people she’s portrayed. When she’s given her longest assignment, playing the role of Catalina Barnes, Quinn begins to bond with the deceased girl’s boyfriend. But that’s only the beginning of the complications, especially when Quinn finds out the truth about Catalina’s death. And the epidemic it could start. I want to start off by saying that I was never really into books about death and suicide, because they make me really, really sad (like more than it should make most people). But when I started reading The Program awhile ago, I was captivated with the idea of there being a suicide epidemic - something I had never really heard of in any book before. A world where suicide is contagious - I could hardly imagine it, which is why I had to start this series. And I'm glad I did! I've really enjoyed this series so far, and finding out that there was a prequel was awesome because just when I thought the series was over, I ended up having more to read! 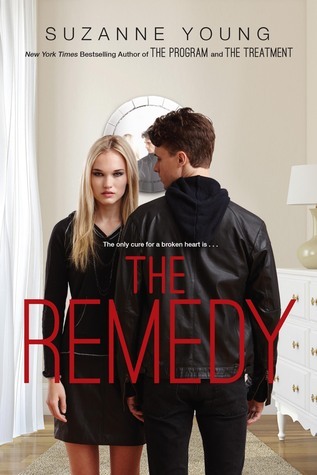 So as the summary explains, The Remedy takes you to a time before the first book in the series, The Program, has come to be. So it's interesting to see the world that the epidemic takes place in before it even happens, even if it's frustrating because you just want to scream to all of the characters, "I know what the problem is! I know what's going wrong! A suicide epidemic is about to start!" It felt similar to reading a book that someone spoiled for you already - it loses a bit of the shock factor when you already know what's coming. So Quinn and a bunch of her other friends are what are called "closers." They're people to go to families and stand in for those who died while helping them cope with the grieving process. It's definitely a bit freaky and there are a lot of people in the book who don't accept it, but Quinn believes it's for the greater good. She doesn't try to usurp the lives of the dead she stands in for - she does it to help families cope with their grief and get over those who they have lost. I honestly don't know if I'd be courageous enough to do that, so I definitely give Quinn credit. There's a major spoiler ahead so please skip to the next paragraph if you haven't read this book yet! I wasn't shocked about the whole suicide epidemic thing and seeing Arthur Pritchard and everything as I maybe should have been, because I already knew his role in The Program and all of the terrible things that will come to happen later. So like I mentioned earlier, there wasn't really a shock factor there for me. But what did shock me was the end - I was completely floored when I found out that Quinn was a closer for her own life. I'm usually good at finding some clues for plot twists, but that one completely knocked me off of my feet and I LOVED IT. Young was very, very great in regards to pulling that one off -- she's definitely become royalty in the plot twist department. All in all, The Remedy was a gripping, emotional read about coming to terms with losing those you love while also teaching you about love and other sorts of loss, with a bunch of awesome plot twists thrown in. This book took my mind for a trip and tossed it around a little but I ended up feeling really great when it was finished -- especially with that cliffhanger! Now I definitely can't wait to get my hands on The Epidemic, which I have to look forward to in 2016!